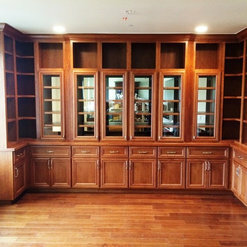 Ross Habecker is a Marine Corps Veteran with five years of experience crafting beautiful custom cabinetry. He has a BS in Technical Management and certificates in cabinetry construction from Palomar College. 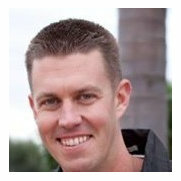 Ross has earned awards for projects completed while he attended Palomar College. Woodworking wasn't always a passion of mine. It took me roughly twelve years to figure it out. After enduring nine years in the Marine Corps I was Honorably Discharged and struggling to figure out my next move. While I sorted things out I earned a BS in Technical Management and built cabinetry and furniture on the side. Soon, I realized woodworking is what I needed to do as a profession to be happy in a career. I've been doing cabinetry and woodworking for five years now and enjoying almost every minute of it. 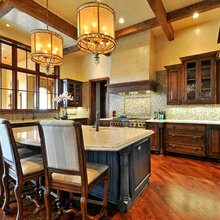 Fidelis Woodworks is a kitchen and bath remodeling company specializing in custom cabinetry. 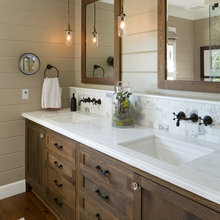 We do all aspects of your remodeling including electrical and plumbing. The cabinet shop is located in Fallbrook, California. We service all over north San Diego county and the Temecula area. We were left in a very precarious spot because our previous contractor left our job early and claimed to have his partner ready to come in and put in the finishing touches on our brand new kitchen, but no one ever showed. After searching around we were connected with Ross and he came in and turned a horrible situation into something amazing. He went through and replaced every drawer box, fixed mistake after mistake and gave us the kitchen that we were hoping for from the onset of what turned into a year long project. It was refreshing to have someone working for us that was extremely professional and put in the extra effort to really help us out in our time of need. He carefully went over every change that needed to be made with us to be sure we were getting something that looked good and was functional. His attention to detail was incredible as he kept us from ordering things that we had originally planned on putting in but due to the previous builder's mistakes would of left us with awkward spots in the kitchen. 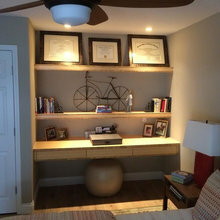 He finished the project in the exact amount of time he said it would take him, even spending some extra time one day to make sure things were right. Ross is amazing and we are definitely going to be using him whenever we have another project in our new home. Thanks Dan! It definitely wasn't the easiest job to walk into, but I'm glad I could help you guys out. Ross is very professional in attitude and ability. He is prepared with the right tools and equipment and works quickly and quietly. He is very polite and knowledgeable. He was able to recognize an issue in my kitchen and then come prepared with materials to fix the problem. I am highly recommending Ross to anyone needing a quality woodworker/cabinet maker. I have worked with Ross on a number of projects varying in scope and scale. Ross has the highest quality and craftsmanship standards and puts a priority on professionalism and customer service. You can be assured that any project Ross is involved in will be completed on time and will result in 100% customer satisfaction. We recently moved from a custom designed and built Appalachian log home in NC to Fallbrook Ca to be near our kids and grandkids. The new house had a microwave in the kitchen mounted so high that I thought it was dangerous to use, and the cabinet it was in stuck our so far from the wall that I was afraid to use one of my stove burners for fear I would bump my head on that cabinet. I found Ross and was so glad I did, he had some wonderful creative ideas for the changes we could make so I could have the microwave in the drawer that I wanted, and he actually managed to match the existing cabinets. He was a pleasure to work with, his work was very professional and affordable. I will definitely have him back for more changes I plan to make to my new home. Thanks Joni! Glad I could help you guys out and look forward to withing with you again in the future. *Top notch craftsman *Better Prices *Did all the little extra things with a friendly enthusiasm and didn't up his price! *Had a lot of great ideas. Some saved use some real money, too! *Finished job was terrific. *BEST of ALL: He's a man of true integrity! *We choice a winner for our three phased project. When the next project comes up it will be Ross for sure! Thanks John! Glad I could come through for you guys! Curteous, knowledgeable, and quality of work excellent. 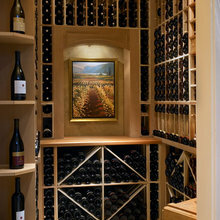 Designed cabinetry to our needs, fit perfectly, and craftmanship was excellent. Listened to our wants and needs, and remained within our budget. Timely bid and completed work ahead of schedule. Excellent communicator. Cleaned up after completing work. Easy to work with. Would hire Ross again without hesitation!!! Thanks Janis! It was a pleasure working for you guys. 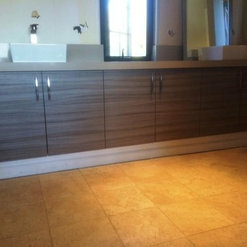 We hired Fidelis Woodworks to reconstruct a kitchen peninsula which the previous owner had lowered in amateur fashion. It needed to be raised to a ‘normal’ height. Ross was a former Marine so we knew there was a good chance he would be disciplined and would take pride in his work. We were absolutely correct in this assumption! 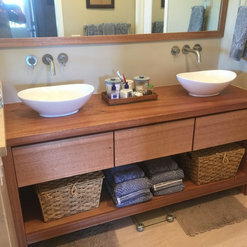 Ross built a new half-cabinet and installed a butcher-block counter-top. 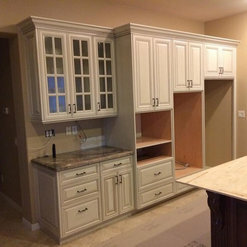 Following this, he refaced the pre-existing cabinetry casing and installed all new doors. He also reconstructed a section replete with new drawers and a cubby-hole. The final product looks outstanding and is a testament to his need for perfection. You can take the individual out of the Marines but you can’t take the Marines out of the individual. We couldn’t be happier with the work he did!!! We would highly recommend Ross/Fidelis Woodworks to anyone who has a wood project of any kind. Thanks Alex! 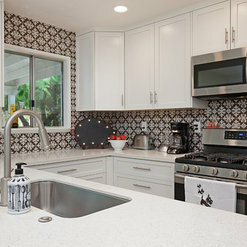 I'm glad I was able to help your kitchen become functional again! Thanks Phil! I'm glad we could save your flooded cabinetry. I highly recommend Mr. Habecker for anyone looking for a quality tradesperson to do woodwork in their home. Mr. Habecker is the consummate professional, with attention to detail, excellent follow-through, and precise workmanship. We hired him to build cabinets and shelves around our fireplace and turn an awkward recessed nook area into a more functional dry bar area. He listened to our ideas and turned them into practical pieces that fit within our budget, and complimented the space available. Throughout the process he was pleasant to work with and the pride he takes in his work was evident in the finished product, flawless in finish and design - better than what we imagined. We plan on using him again for any projects of this nature in our home, not only because of the quality of the finished product, but because of his outstanding professionalism, which made the whole process stress free and pleasant. Thanks Justin! I'm glad we could turn that awkward space into something of use! Ross is an extremely conscientious craftsman who I would recommend and trust with any size project. He creates high quality woodwork quickly and beautifully. We recently had our bathrooms remodeled. 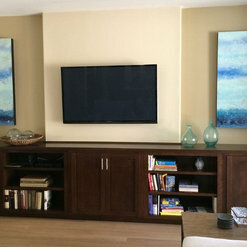 Fidelis Woodworks (Ross Habecker) did the installation. .Ross is an ex-Marine, a professional, on time, with attention to detail. The cabinets were flawlessly installed. 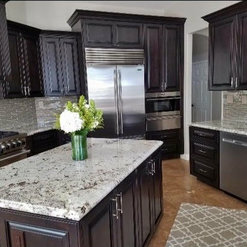 As a matter of fact, the granite installer that followed wanted to know who did the cabinets because they were done so well. Ross also did the electrical and plumbing. Fidelis Woodworks would be my first call. Thanks Bob! It's always a pleasure working with you and your lovely wife!